Hurry! Save.ca has a hot new coupon for a Free Whiskas Perfect Portions Cat Food! 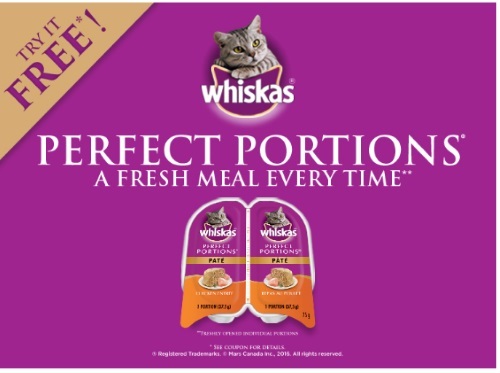 Coupon is for 1 Free Whiskas Perfect Portions Single 2x 37.5g any variety! This is a mail coupon. Limit 1 per household. Expires June 24, 2016. While quantities last. Available to ON residents only. Please note, you can also get a second one of these coupons from the Walmart coupon portal here!